© 2001 Dorothea Rockburne/Artists Rights Society (ARS), New York. Photograph by R.H. Hensleigh. From cool austere works that employ large expanses of folded white paper to radiant and richly-colored composition on flowing vellum sheets, Dorothea Rockburne’s works are marked by intellectual rigor, innovation, and a remarkable em.e of wonder. 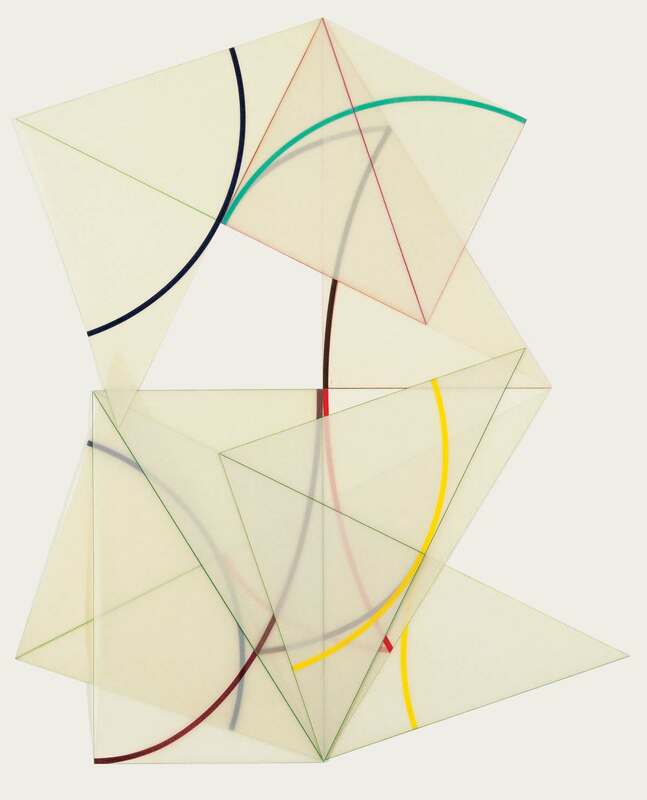 Although she has at times been associated with movements such as Minimalism, Process Art or Conceptual Art, her abstract works ultimately defy such classifications. Informed by a fascination with mathematics, science and astronomy and deeply influenced by the painting and architecture of the Italian quattrocentro, Rockburne’s works embody a complex expression of correspondences. Rockburne attended the experimental Black Mountain College in North Carolina in 1950 where she studied painting with artists such as Franz Kline and Philip Guston, music with John Cage, dance with Merce Cunningham and mathematics with Max Dehn. Alongside classmates like Robert Rauschenberg and Cy Twombly, Rockburne flourished at Black Mountain as she found the intellectual foundation and artistic inspiration for her future work. Following Black Mountain, Rockburne’s early works were characterized by a reductive process and an economy of materials. Drawing lines and geometric shapes directly onto walls, cardboard or brown wrapping paper, Rockburne’s works in the 1960s and early 1970s were subtle gestures that combined minimalist artmaking processes with her growing interest in geometry and mathematical theory. In these early works Rockburne explored the width, length and depth of the materials she used as she began folding her paper surfaces, often creating double-sided drawings. From this early period, Rockburne conceived her works in series as she explored the dynamic potential and various geometries of her otherwise flat and passive materials. The Shuey Collection includes three of Rockburne’s folded paper works from two significant series. The earliest is Arena III from a series named after the Arena Chapel in Padua, Italy, which contains Giotto’s great fresco cycle.In the Arena Series, as in many of Rockburne’s works, she employs the ancient mathematical device known as the Golden Section, which is a method of dividing a line in such a way that the shorter of the two sections stands in relationship to the longer section as the longer section stands to the sum of both. The proportions of the Golden Section were known and employed extensively by the architects of ancient Greece as well as by Italian painters and architects of the late Middle Ages and Early Renaissance. The proportional relationship of this geometric phenomenon appealed to Rockburne not only for its link to the history ofWestern art but because of its structure, which she characterized as “pure magic and light.” The mystical geometry of the Golden Section drove Rockburne’s artistic production from the time she first employed it in the mid-1970s. Rockburne’s Arena III features vellum sheets that have been marked by colored lines and arcs; when folded with Rockburne’s precision, they create a pattern of overlaying crosses, triangles and other geometric forms. The translucence of the vellum makes every mark visible to some degree, while a layer of varnish on one side of the vellum differentiates the paper’s front and back. A series of thin colored plumb lines indicates Rockburne’s initial measurements while thick colored-pencil arcs articulate the many layers of Rockburne’s foldings and overlappings.